In 2008, Dan Markovitz was meeting with a group of R&D engineers at a high tech company. The engineers began complaining about e-mail. They were overwhelmed by the hundreds of messages arriving every day in their inbox, but at the same time, they agreed that this was unavoidable. Without such intensive e-mail use, they reasoned, their teams’ efficiency would plummet. Think about this question for a moment. The Apollo program was massive in size and complexity. It was executed at an incredible pace (only eight years spanned Kennedy’s pledge to Armstrong’s steps) and it yielded innovations at a staggering rate. And it was all done without e-mail. How did the Apollo engineering teams manage something so complicated and large without rapid communication? Fortunately for this particular group, an answer was available. It turned out that a senior engineer at this high tech company had also worked on the Apollo program, and someone asked him this very question. His team met from 9 – 10 am, three days per week. I find this anecdote fascinating. I’m not implying, of course, that organizations should abandon e-mail altogether and fall back on Apollo-era carbon copies and secretary pools. But hearing this story induces a key insight: the way we currently use e-mail technology — in which our day is interrupt-driven and quick responses are expected — is not a necessary condition to successfully manage teams and organizations tackling hard problems. If you’ll excuse some uninformed speculation, my guess is that if we could go back in time and outfit the Apollo engineers with e-mail terminals,* two things would have happened. First, their work lives would have become more convenient. Second, it would have taken them longer to get a man on the moon. But at the very least, we should use this story to remind ourselves that the statement, “I have to be constantly connected to effectively manage my team/company/project,” is not a tautology; it’s a hypothesis — one we can and should continue to rigorously investigate. * Let’s be honest, if we went back in time to give these engineers e-mail terminals, the first thing they would do is pry open the cases and hijack the processors to replace the creaky technologies they were stuck using (the Apollo guidance computer ran at a stately 1 Mhz and had all of 2k of memory to work with). Totally agree. Eyes on the target, and then just focus on actually working on how to reach it. Communication and plan adjustment are important, but they should not happen at a very high frequency. We should leave time for the actual works. I would like to give an example in ocean swimming. Suppose my target is a remote lighthouse. If I constantly check where I am, I will likely be exhausted, and may never reach it. A better way is to focus on swimming itself. Set the direction right, focus on swimming for some long time, rest and adjust direction, and repeat. We need communication, but the most important thing is to get works done. Without email one has to think about the question for a bit longer. Answering one’s own questions develops thinking power more than asking and having the answer “instantly”. More deep thinking before getting the answer from someone else might be helpful. Keep in mind that, in the absence of email, they probably divided a task in to manageable portions that each could work on without intense coordination. A does X, B does Y, and C does Z. When each is finished, X, Y and Z by design work together. New technologies also need to have their gotchas learned and email, as long as it has been in use, is still abused more than fixed. My ultra-reliable 1981 Toyota Corolla was, I’m told, one of the first to be designed using CAD. Today that has a bad—components are stuffed together so tightly, one component can’t be worked on without removing six others. Then the result was more weird. Probably to make the cabling and connectors work, components that are part of the same feature are scattered all over. The result is a mess. The 12-volt power to the fuse panel under my dash that distributes power to almost everything, including the starter solenoid, passes through about four multi-pin connectors before it gets there. When it went bad, I tried to trace down the problem through all those connections and finally decided “to heck with this” ran a direct wire. 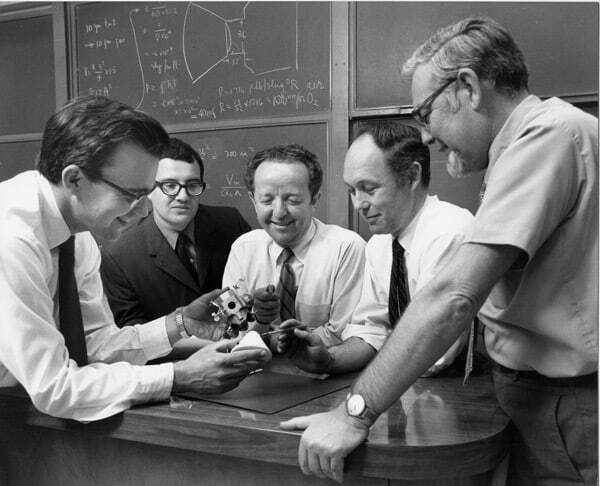 And we shouldn’t forget that these people spent a lot of time solving problems that we’d brute force today. A Texas Instrument engineer working on a military project in the early 1970s excitedly told me of a clever way he’d been able to redesign a chip to save two or three logic circuits. Even AND gate or whatever came with a significant cost. Not so today. What you mention in your opening paragraph is something that seems to have been forgotten because of what you mention in the closing paragraph. Because we’ve become so efficient at brute force problem solving, we fail to break projects up into efficient, easy to tackle chunks. That tendency isn’t just limited to project management or the business world, it has even wormed its way into higher education. I sat down with the head of undergrad mathematics at a prestigious university, and he said in response to my questions about the effectiveness of online homework that it does teach a brute-force approach that isn’t necessarily best. I believe this tendency is going to be disastrous when used against large, very complex problems with too many variables to keep in focus (global warming or preventing the spread of a disease for example) and against problems where there are large areas with “known-unknowns” (space exploration for example). Because the problems are kept in such an unruly form, there is a strong chance that a real solution, let alone the optimum, will fail to materialize. I’ve started reading “The Harada Method The Spirit of Self-Reliance” (http://www.amazon.com/The-Harada-Method-Spirit-Self-Reliance/dp/0971243603) – it’s about following a process to achieve success, require effort, time and coaches to achieve goal. It seems to support your hypothesis of committing yourself to something you want to learn more about and becoming the best at it through a process that Takashi Harada developed during his time a coach a poor performing school in Japan. Could be useful with your quest of studying success. However there are few articles written about on the internet – curious as to who has tried the method and their results? Honestly, I’m more interested in the fact that they met face-to-face 3 days a week. Its that collaboration that I feel is missing because the pre-planning is less complex and the project comes together less cohesively with more problems (and interruptions via email to fix them). No telephones? No secretaries? I’m skeptical. I like interruptions. I often return to my work with new ideas that I missed before during “intense focus.” Prolonged focus isn’t always best for creative work, since the subconscious mind needs breaks to generate solutions. I’d say most of my brilliant insights come when I’m not working. One thing the NASA engineers may not have had to contend with is distributed teams over multiple time zones and geographic locations working on the same component. Those would likely have been done in the same location. Face to face communication is always more efficient. …but then that interferes with the millions, maybe billions of dollars companies have spent on the ‘off-shore’ paradigm…whether it works or not!! Again, it depends on the circumstances of your line of work. Flight Control Operations did establish teletype connections between the stations from Project Mercury on. In Houston they would communicate over voice loops, listening to 3 or more voice loops simultaneously. Ignoring an exploding oxygen tank like on Apollo 13, and taking a week off to ponder the problem in a focused manner, probably wasn’t an option. Instead, they reacted very swiftly and definitely interrupt-driven, saving the lives of Lovell, Swigert and Haise. Likewise, on Apollo 12, a lightning hit the Saturn V during ascent. All electronics went offline. It was John Aaron who saved the mission with his famous “SCE to AUX” call, restoring the telemetry downlink and ultimately fixing the problem. He did that in about 30 seconds. On Apollo 14, floating soldering residue was causing random shorts in the LM’s instrument panel, creating the danger of unintended abort during descent. They got a programmer to write a routine to bypass that switch, and they radioed up the instructions, while Shepard and Mitchell hacked in the code on the DSKY in their LM, all that during one lunar revolution that lasted about 2 hours. Again, quick reaction was essential to save missions and also lives, in the case of Apollo 13. Likewise, I think it’s quite a stretch to claim that they wouldn’t have reached the moon in time had they had e-mail. In fact, at Grumman, where they built the LM, at times they had trouble producing the drawings quickly enough. I suspect having AutoCAD and mailing the drawings to the engineers might have saved them substantial time. The point is: Yes, you need big chunks of uninterrupted time to think about a hard problem deeply, to come up with a zero draft paper, to set up an experiment, to code a class or package. That’s not even a new insight, it can be traced back at least 50 years. But it’s sort of narrow-sighted to assume that this mode of work is equally suited to everyone in any circumstances. I appreciate your detailed and thoughtful comments. It is easy to jump on the bandwagon and agree with the battle cry. You gave some specific examples of how interruptive thinking was used within the confines of the circumstances. I was trying to read this article, but then I got I interrupted by email. I know you’re making a joke, but still – it’s your choice whether or not you get a notification every time an email arrives. If not, get yourself a decent email client. If you may really receive some emails which need your immediate attention, set up a filter to alert you just for those ones. NASA weren’t always so efficient though: I remember hearing the story of how they spent millions of USD designing a pen that could work in space (ink is a liquid, in zero gravity) while the USSR space programme just used a pencil. Here’s an idea that I don’t think you’ll like! Maybe they achieved so much with so little time because they were passionate about what they were doing. And they would have been even more productive with email. I’m sure they were passionate about what they were doing, but I bet part of why they loved what they were doing because they weren’t dealing with constant e-mail interruptions. I’d imagine that a bunch of rocket engineers and rocket scientists need collaboration, but they also need focused time to solve very tricky problems. Could you imagine, it’s 1967, you’re working for NASA, and you keep getting e-mails about the company picnic or the latest HR update, or maybe someone is asking you for a progress report on something or other, and they need you to stop what you’re doing so that they can send that report up to their boss? Yikes! I highly doubt that the scientists and engineers woke up at age 7 and realized, “my passion is spaceflight!”, especially considering most of them were in probably already into their careers before they worked for NASA. I mean, it only started in 1958; I don’t think any pre-existing passion was present. I bet they love what they do, but part of that requires a good work environment and a place where they can succeed. The pencil story is a myth. It seems that our eye is on the wrong ball here. Isn’t the point that our use of the tool is the problem rather than the tool itself? It’s our use of email that gives us the feeling of “pretend productivity and connectivity” rather than that email is a primary communication medium. I’ve recently began experimenting with not checking my email until after 12pm (yes, I know not everyone can do this) and found that my productivity went up and my connectivity and communication stayed the same. In other words none of the people who communicated with me were impacted but I experienced significant benefits. Further I try to call or talk directly to people anytime the email is going to get beyond 5 sentences. Small tweaks, but they yield good results. I’m not saying we need to return to the “good old days” (nor, I think is Cal) but many things could be solved more efficiently in person than they ever could electronically. At the risk of sidetracking the discussion, I must reply to the myth about NASA spending millions on a pen while the USSR used a pencil. Fisher Space Pen company developed the pen on their own dime. Pencils are not used in space for good reason – they break, and a piece of broken lead floating in space can be very bad. Anyway, I really like this topic and the discussion. In fact, I wish someone would investigate and write a book about how NASA did this from a team communications perspective. I have been working in IT since 1979, and I honestly cannot remember how we did things before email. I try to avoid using my email… I feel a bit envious of that time. Everyone was on the same page about communications; mostly because they didn’t have a wide range of options, but now most people want an email address to communicate through. I gotta admit it’s a downer. You don’t want to be the person who interrupts their busy lives, so a simple email will suffice. I prefer to work with people face to face. I only have receipts, confirmations from work, and bills sent there– going green. I believe that we might be fixing the wrong problem. Email is merely a technology that allows us to send and receive messages quickly. The amount of email we must process, and the choice to be “interrupted by email” are not problems by themselves. We simply have taught ourselves habits that are only suitable for low volumes of messages. At high volumes, we need different tactics. This is true for the individual and also for the corporation – problems crop up when our unsuitable practices interact with volumes to produce chaos. But the problem isn’t caused by email, and reverting to paper won’t help. We are confusing correlation with causation when we blame email technology. If it’s a fact that we can’t turn the clock back, and return to old technology and/or low volumes then we must seek answers elsewhere e.g. in our practices, and in our “agreements” with our employers regarding email responsiveness, acceptable hours to read/respond, the acceptability of multi-tasking etc. ON another note, there is hard evidence emerging that planning supersedes reacting – notably, in a family CEO effectiveness study from India. But, should we be surprised?